Forget about F1 or race cars. And yes, you can forget about driving licenses too. It's not an event about your dream car. Nor is it a high-class car exhibition. What is a Soap Box Derby, you say? Well... ... You'll be surprised at the long history which dated back to 1934 that began with a popular car race that was held in America. Initially intended as an activity for the youth, it slowly transitioned into a fun-filled race for all ages. Yes, it's a car race BUT imagine this - you'll be racing YOUR very own D-I-Y car made out of your creativity, and it shall require no fuel to move. But that's how it's done! I suppose this guy must've thought of the idea while he was in the toilet brainstorming for ideas. LOL. My jaw literally dropped while I stared at the picture. Whoever created this was pure genius. It looks so much like a real car that nobody would've guessed it's only a Soap Box car, made out of a simple kart! 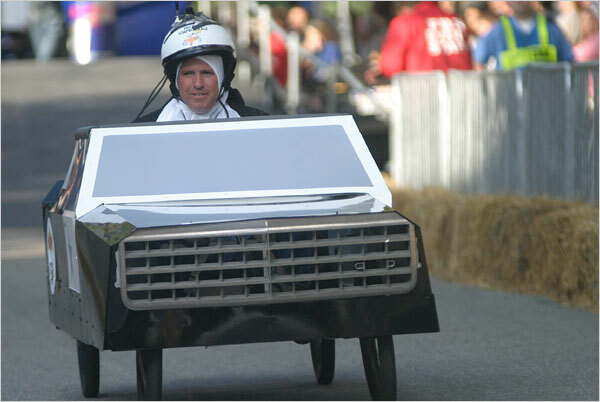 I got so interested that I decided to do some Googling work to look at more soap box cars. I mean, aren't they inspiring? Soap box cars standing in line, ready to crash....and one of them apparently looked like the front part of an aeroplane! COOL MUCH??! After looking through these photos, I am sure you would be feeling excited in one way or another. How about coming out with one of your own and be part of the race with your friends or family? Not only can you unleash your creativity with the design of the Soap Box car, but you can be sure to enjoy a fun-filled Sunday afternoon with your loved ones and probably emerge as top 3 winners to win attractive cash prizes! A chassis will be provided to each team and you can begin creating your very own Soap Box car! Here's an example by The Muttons! Click on HERE to be directed to the Registration form. After the registration process, you can go ahead to brainstorm for your fit-for-a-king design, collect your chassis , build your soap box and finally test it out! Do refer to HERE for the rules and regulations. Hurry, registration will end on 15th August 2012! And oh, did I mention that there will be our local celebrities participating in the race too? And our lovely host, Jean Danker! It's going to be a fun-filled and CRASH-FUL (if ever there is such a word. LOL) Sunday! So.. do CRASH your BEST! Lol. Even if you aren't participating in the race, you will be able to enjoy the fun by coming down and supporting the 'racers'! BUT NO, I am not going to dress like this although I know it's appropriate. This was just a photo that I took during a themed photoshoot with Sam Song. Haha. aaannd... WAAAIT.. That's not all! If you've watched Sasuke Singapore on Channel 5 after the NDP yesterday (and feeling tempted to try it), there will be a mini Sasuke held on the day of the event as well! There are loads of surprises awaiting you on 2nd September 2012 at Singapore Expo Hall 6! Do come and be part of the moment! I'm definitely getting my camera ready and be back to blog all about it. For those who are attending, I'll see YOU there! EXPOSED on Kopenhagen Rabbit Keychains: You are supporting animal cruelty WITHOUT knowing it! Going Taiwan the Free & Easy Way!